Maybe for dinner, you inhaled a Pop-Tart while perched on an ottoman, your spouse ate chicken while reading magazines at the kitchen island and your kids gulped down pizza in front of the TV. Or maybe your dining table holds so much clutter that it functions more like a desk instead of a place for food. Or the hassle of bringing out plates and silverware puts a damper on the idea of gathering the family at the table for dinner. But it doesn’t have to be that way. Thoughtful design for home dining areas can make it possible to enjoy meals as a family. Jumping on these evolving trends can make eating together easier and just downright fun. Take advantage of open floor plans. Modern floor plans have done away with walls and partitions between kitchen, dining and living areas and encourage families to spend more time together, especially around mealtimes. Great rooms and open floor plans “Just seem to be a better match for how people live, versus having formal dining rooms,” says Nancy Barisof, head of her own Seattle design firm. The trend to larger, professionally equipped kitchens has helped undermine the formal dining room. “People gravitate toward whoever’s cooking,” Barisof says. Welcome kitchen diners by incorporating comfortable furniture into the kitchen, even adding a table lamp to help establish a gathering-roo feel. A well-designed kitchen island can make quicker meals, like breakfast, more meaningful. 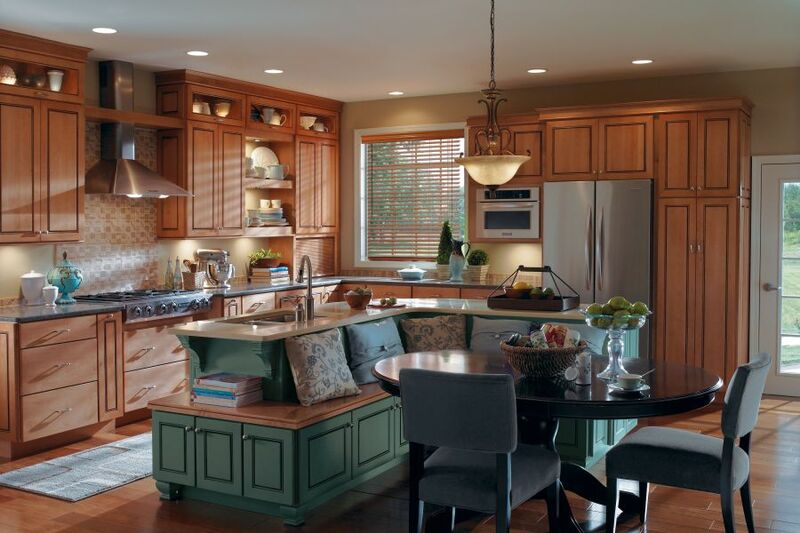 Kitchen stools that swing out when needed and can be tucked back under the island when not in use are the new favorites of Kerrie Kelly, owner of Kerrie Kelly Design Lab, Sacramento, Calif., and the author of “Home Décor” (Oxmoor House, 2009). A mixture of furniture in the kitchen can help set the stage for socializing. You don’t have to default to a long dining table with matching chairs. In fact, think benches. “Banquettes have been hot on the scene,” says Kelly. Pair an antique or rustic table with minimalist chairs. When it comes to kitchen appliances and accessories, think convenient and kid-friendly. Find ways to simplify setup and cleanup. For example, a freestanding unit with open shelves near the dining area can hold flatware and dishes, Barisof says, making everything more accessible. Having young children doesn’t mean you’re forced to cover everything in vinyl to protect furniture. Treated upholstery fabrics – Barisof is a fan of the Nano-Tex finish – allow families to have spill-resistant, fashionable chairs and benches.